Win a T-Fal OptiGrill (a $179.00 value)! Here’s your chance to win a T-Fal OptiGrill–worth $179.00! Grilling is one of the healthiest ways to cook—and with the very cold temperatures this Super Bowl Sunday, it may not be that convenient to grill outside. Here’s your chance to win a T-Fal OptiGrill. It’s one of the most advanced indoor grillers we’ve ever tried. This is the first grill that has precision grilling technology that will cook your burgers, stead or fish to perfection. The OptiGrill measures the thickness of what you’re grilling and you just tell it how you’d like it done—from rare to well done. Once you set the indicator to how you’d like your burger, steak or fish done, the OptiGrill does everything else and alerts you when it’s done grilling. There are also six automatic settings for burgers, beef, poultry, sandwiches, sausages, red meat and fish. 2. “Like” Appetite for Health on Facebook, and please “Like” T-Fal too. Remember, extra credit is given to those who share AFH nutrition or fitness articles on social media–tell us where you shared (a link is handy)! Open to US residents. Entries will be accepted until midnight EST on Monday, February 3, 2014. Check back here to see if you won. I subscribe to the e-newsletter, Like Appetite for Health and T-Fal on Facebook. I’d love to win an OptiGrill so I can grill healthy all year long. This would be awesome to win. I am craving some grilled foods, but with the temperatures in St. Louis that is just not possible right now. This would satisfy my craving and we could eat healthy too. I would love this because it’s much healthier eating! I would love you win this grill because I currently don’t own one but enjoy making new and healthy meals for myself and my family so this would be a great addition! Saturday, Feb. 1, is also my birthday so what better gift than this grill?! Looks like a fantastic grill! Easy to use and make great meals! Would love to own one! I subscribe and I like both on facebook. I would love to win because healthy cooking has really become a priority for me. This would be a real step in the right direction. I have your free e-newsletter, “Like” Appetite for Health and T-Fal on Facebook. Why I would love to win an OptiGril is I could grill fruits,vegetables, sandwiches and fish so can have healthy snacks and meals. This will keep my weight loss steady and I love the taste of grilled foods. I’d love to try vegetables on this grill. I subscribed to both and love grilled. Omg! This would be amazing! I love to grill but live in an apartment and do not have a porch or yard. this would be great to have! I have an old, well-used grill pan. My grilling cookware could definitely use a T-Fal makeover! Love your emails. Like AFH and T-Fal on Facebook. Shared link for extra credit. I would love to win this grill for indoor grilling during Minnesota’s 9 month winters! I would love to win an OptiGrill as I have been losing weight and need to achieve my goal and this OptiGrill would definitely get me there with healthier grilled food recipes! I would love to win this because I want a grill so bad, but don’t have a place for an outdoor grill. I would love to grill chicken and fish on here. I’m signed up for your newsletter and like on facebook. I’ve also shared articles via email with friends. I miss my outdoor grill and would love to grill indoors. It would help tremendously with my new eating regime. This would be great for eating alone or just cooking for one or a cold winter night. I would absolutely LOVE this!! Thank you! I already receive your newsletter but I signed on for FB!! I need something easier to cook Chicken breast on ……my hubby and kids are addicted to chicken. win an OptiGrill as I have been losing weight and need to achieve my goal and this OptiGrill would definitely get me there with healthier grilled food recipes! I sunbscribe to your newletter and like both FB pages. I would love to win this because it looks amazing. A great way to make a healthy meal for my family nad would really great on these freezing cold winter days when my BBQ pit is snowed in. My husband has heart disease and I am dieting also. Cooking healthier is our life. I subscribe to the e-newsletter, Like Appetite for Health and T-Fal on Facebook. I’d love to win an OptiGrill so I can grill healthier for my entire family. I subscribe to your email, and Like AFH and T-fal on FB! I would love this grill because in our apartment complex we are not allowed outdoor grills. We have had such a harsh winter that it would be wonderful to be able to grill again….indoors. I would love to win this – I am a griller and I love to cook! I’d become a master at this device to and make awesome food! Living alone has made it hard to cook healthier for myself. OptiGrill looks like a wonderful kitchen tool to make grilling lean proteins a snap! I am the chief cook and bottle washer for a VERY picky family (In addition to working full-time.) I’ve always wanted a grill like this and I’m sure I could make magic with something as wonderful as this addition to our kitchen. I love your newsletter and follow you on FB! Would love to cook some boneless chicken breasts! Yum, I can taste them now. When our family eats meat, this would definitely make it healthier! I would love this because I’d love to grill up some healthy foods for my family. Would love to win T-fal OptiGrill because I want to eat healthy! I live in a n apartment and have no outdoor space for a grill. What an awesome grill! Since I’m trying to cut down on carbs and fat, this would be a great way to prepare lean cuts of meat. I’ve never grilled fruits before, but would definitely give it a try. Veggies would, no doubt, taste great cooked on this grill. I’ll be sharing this post, along with some of your recent nutrition information! I would love to win the TFal OptiGrill so I can make grilled foods such as chicken and shrimp. I live in a small apartment and have no access to an outdoor grill so this would be perfect! Got your email and like you on FB…. would love the T-Fal for cooking paninis or chicken breast. Yum! I love your newsletter and Like you guys on FB. I also bought the book and enjoy the meal plans. This grill would help me continue to eat healthy in the cold New England winters as well as give me more options and experiment in different food options. And I am retiring from the AF in June after 21 years and this will help keep me on track. Would love to win this grill. The indoor grill that we have now has seen better days. We could definitely use a new one. I embrace cooking healthy and this looks like a wonderful appliance to add to my kitchen to reinforce healthy eating habits for me and my family. 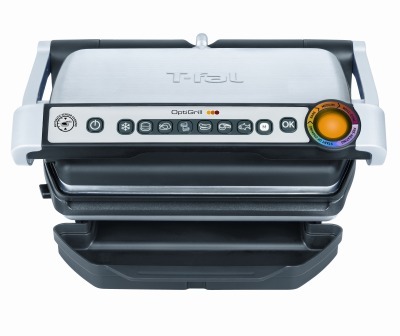 I love that the TFal OptiGrill has different settings for veggies and meat for optimum grilling results. I’ve always wanted one of these, so I’m hoping to be a lucky winner. I Like both AFH and TFal on Facebook and I’m signed up for the newsletter. This would be great to use in our camper. I would love to win because ive always wanted one of these and it would make cooking so much easier. My hubby is a truck driver and we go on the road alot and this would help tremendously with sticking to my healthy eatting plans since I could cook in our truck and wont have to buy junk from the truckstop. I’d love this! It would make grilling and sandwich making so easy year round. I would love to have this to be able to cook and eat healthier. My wife and I made a resolution this year to start eating healthier. We weren’t that bad before, just want to move up to the next level and this would be a nice tool to aid us in our quest! I subscribe to your newsletter (love it). Am also a FB fan of you and T-Fal. I would be thrilled to add this to my collection of healthy cooking appliances (steamer, nu wave). We love eating healthy and being healthy. We have lots of grandkids that we want to be around for! Thanks so much for the chance! i would love to win the T-Fal OptiGrill so I could grill chicken for a healthy dinner. I love the taste of grilled foods, but don,t have a lot of time for the grill to get going by the time I get home. This would be great to have. I’d like to win because it’s cold out there & I want to grill some yummy food! The T-fal Optigrill looks like an awesome tool for my kitchen! I would love to win a T-Fal OptiGrill because both my husband and I are type 2 diabetics and this would be an easy and fast way for us to eat healthier. It would also allow us more variety in our diet by having grilled vegetables more often. I already receive the e-newsletter, and have liked the Appetite for Health and T-Fal on facebook. I have been sharing some posts off Appetite for Health with my TOPS (Take Off Pounds Sensibly) friends. Thank you for great information on living healthy. I am an email subscriber and like both of the FB pages. I would like to win this grill because of how versatile it is and it looks easy to use! this wonderful grill would be practical and made healthy eating and preparation enjoyable and special. I am an e-mail subscriber, Liked both pages. have liked both pages and am an email subscriber. Am trying really hard to eat healthy as I need to drop over 75 pounds. Want to be around to watch my grand babies grow up. Would love to win this so I could cook healthy. Def need to cook healthy. Because I am trying to eat healthier. I subscribe by email and like both pages. Thanks for the chance to win. This grill looks amazing! The best things about it are it supports healthy, sane eating and it can be used all year-long. I would love, love to have this. I liked both pages and subscribed to e-mail. Signed up and liked both pages! This is great! I also sent to my friends on Gmail, they have been talking about the optigrill for a while too. I would LOVE to win this. I love cooking, and I love grilled foods but don’t own a working grill. Fingers crossed. I just had a baby December 10th and winning this grill would help me eat healthy and lose the weight! It’s harder to grill meat and veggies in the winter due to the cold, so this would be perfect for my family and I! Thank you! I love the taste of grilled food, but my husband doesn’t really like to grill and I don’t want to fuss with a gas grill…it scares me a little. This would be a great alternative! I would love to win this to put some more variety in the meals I’m serving my family. We love to grill during the ‘nice’ months, but can’t really do it in the winter here. This would be perfect for solving that problem! I did all the requirements above and resubscribed to the emails just to ensure that I had done everything (it was my email that brought me to your page this morning). We have just been dumped on with 10 inches of snow (or more in Virginia Beach VA) and grilling my veggies and meat sounds like the way to go without having to go outside to do it. The grill above looks wonderful. I love your site even though I have just subscribed to it this week, never knowing that I could try to win something wonderful. Have a great week….I would love to have the grill today although that is now possible. Another way to have delicious and “good for you food”. THis looks like such a much less messy approach to grilling indoors! Thank you for the giveaway! We don’t have any kind of grill so this would be a dream to win! Thanks! Would love to grill indoors all year long! I’m already a subscriber and I like you both on Facebook. 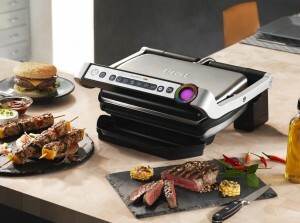 I’m looking for healthier ways to prepare food and I think if we had this T-Fal OptiGrill my son would cook more often. Thanks for the giveaway. I live in an apartment in the city, so an outdoor grill is long missed (coming from my suburban background). I miss grilling out in the backyard so much! With the OptiGrill, I’d be able to grill my favorites indoors! get AFH newsletter and liked AFH and T-Fal – would love to grills more without hassle – this grill sounds fantastic and would love to have one. Thanks. I receive the free e-newsletter, and I “Like” Appetite for Health on Facebook, and I “Like” T-Fal too. I would really love to win an OptiGrill to be able to prepare more healthy meals for my family. It looks fabulous!! I would love to win the T-Fal grill because I would love an easier way to grill and indoors. Wow! Who doesn’t want to grill fruits and veggies indoors! Amazing! I would love a T-Fal grill because I need to reward myself for losing 47kg the healthy way!! Would love to have a T-Fal OptiGrill to roast veggies (my wife and I are vegetarian). Never tried roasting fruit, but it sounds good. this would be awesome to help me cook healthier for my 4 kids 🙂 quick after work suppers!!! I like both “App for health” and “T-Fal” on facebook. I shared “Foods to keep while dieting” on my facebook wall (Sharky Storm). I’d like a grill because it would encourage me to eat more vegetables; I love grilled vegetables! I receive your newsletter and like you both on Facebook. I would love to have this because grilled chicken is my go to all years long and I hate to see the hubs standing in the cold! What an awesome giveaway. I Signed-up for your free e-newsletter and love it. Already “Liked” Appetite for Health on Facebook, and T-Fal as well. I want to win an OptiGrill because it’s perfect for so many recipes and will definitely helps my family eat smarter and healthier. Thanks for hosting the giveaway. 🙂 I’m off to share this giveaway in my social media. I know my friends and family would love it too. I liked both on fb and signed up for the newsletter. This grill would be perfect for the cold winter months of MN when it’s just sometimes too darn cold to take on the elements! I all ready receive you e-newsletters and like both on Facebook. I would love to win the OptiGrill to be able to try new grill recipes. I think you can grill almost anything and this is a healthier mode of preparation. Keeping fingers crossed! So excited for this giveaway! I am signed up for your newsletter and Like Appetite for Health and T-Fal on Facebook as well. I live in an apartment so cannot grill outside. I would love to grill squash and other veggies like corn and potatoes on this lovely grill. The T-fal Optigrill would let you grill year around with no hassle. It is 19 degrees outside.,, …too cold to grill, with propane gas prices is rising…too expensive to grill, and with the T-fal Optigrill you would be able watch the rest of your dinner cooking while grilling inside. Great idea plus a healthy one. Thanks, for even the opportunity to try to win. I love grilling, this makes indoor grill possible, more burgers for my family to enjoy! This would be a healthier way to grill. And I could grill in any kind of weather. Because is the easiest way to cook healthy and delicious!! Would love to win this from such a great company who makes top notch products. I love this so much I shared it on facebook!! I shared it on twitter as well!! I would like to win one so I don’t always have to go outside to grill when it is really cold! Plus it looks like it would be a nice, easy way to grill. I subscribe to your newsletter, Also like Appetite for Health and T-Fal on Facebook. I’d love to win an OptiGrill so we can grill inside. We love grilled foods but grilling in -30 is kinda tough 🙂 This would be great! I have a number of T-Fal pots and pans and love the non-stick surface. Grilling with T-Fal would be awesome! i would love to win this grill for the main reason that i don’t know anything about grilling – this seems like it does all the work for you! I would love to win to get healthy and stay healthy! I take care of a 77 yr old senior, have kids and still have ourselves to keep in shape & good health and this would help us to stay on the track with eating healthy, better and quality meals. I’d love the t-Fal Optigrill because it would be great to have a grill that doesn’t burn the outside and leave the inside undercooked-something that happens too much when using the BBQ. It would be a healthy way to grill the foods we love. Would love to be able to cook on the grill all year long. Especially since its been soooo cold this winter -50 windchills! I’d love to win this grill. I especially like the notion that it senses the thickness of the tiem cooked and cooks it according to to personal preferences. Love this giveaway!! Love you and T-Fal on Facebook, receive these great tip packed emails and tweeted this one. My favorite feature on the T-Fal OptiGrill is the Frozen Food function to defrost and cook all types of food. As a busy Mom of 3 kids, 2 fur babies and one spouse, I forget to plan dinners during many a weeknight and weekend. This feature would save our hungry lives!! lol. Healthy grilling with less fat! Liked/shared & tweeted. I would love to have a grill like this in my kitchen, so that I could make healthier, grilled meals for my family. My kids and husband love grilled vegetables and lean protein (especially shrimp! ), but with the frigid weather here for much of the year (we live in ND), it’s not easily done. So I can grill healthy meals for my family all year round. telling us why you’d love to win an OptiGrill small condo, not allowed to own or operate actual grills, this would be great! This would be a great way to cook healthier – no fried meats or grilled with charcoal. Love to win Grill Because me and my family enjoy grilled food less oil and healthy. Living in a small apartment there is no room for a real grill. This would be awsome. I would be so excited to win this Opti-Grill. I love my T-Fal fryer, so I know I would love this too. What a great way to enjoy grilled foods year around, being able to grill indoors!!! Would love to be able to grill inside!!!! Perfect for the Super Bowl!!! I dont have an outdoor grill plus who wants to mess with one in the winter anyway! This would be perfect for indoor grilling! This would be an awesome appliance to have considering I don’t cook often due to time constraints and have difficulty sometimes with the cook time of certain meats. would make my cooking life a lot more easier, convenient, and effective. I need to break the “fast food” habit. I’m trying hard to cook healthy. I’ve been using a frying pan, but, I know a grill would be so much better. Thanks! Healthy cooking is what most people want..me included, that would be something nice to enjoy! would love a great indoor option for indoor grilling! so much healthier! Because I don’t own a grill and would love to be able to grill a healthy meal indoors! I love grilling but with subzero temperatures outside it’s just not happening anytime soon. I would love to try an indoor grill like this. I am signed up for the newsletter. I like AfH and Tfal on facebook. I’d like to win an optigrill because I love grilling and I live in the East, where it’s too cold to outdoor grill half the year. I also love that it grill based on food type and thickness. That would be awesome to have. Like both on FB and subscribe to newsletter too! I would love the option of grilling indoors! We are trying to live healthier and I think this would help! I subscribe to e-newsletter, I like AFH and T-Fal on Facebook and posted on Facebook and Posted Tweet. I would love to win the T-Fal grill because of the automatic setting to grill the endless possibilities of fresh goods and to grill it to perfection without adding butter or oils. I am anxious to try grilling fruits which will be new to me which I am curious and anxious to try. Would love to be able to grill veggies all winter. I am getting married in June, this would be great for our apartment since a regular size grill would take up a lot of room — I could still be able to have that healthy grilled chicken in the comfort of my home. I would love to win this wonderful grill. It would be great when I am cooking for just me and dont want to heat up the outdoor grill. I would love on of these. I just started my weight loss journey. I bought a FitBit and a treadmill, this would help me out on the cooking end of things! Looks like a great new way to start grilling. Looks more healthified! I have not grilled anything in several years and miss it. I would love to do some healthy grilling without the coal tar briquets. I subscribe to the e-newsletter, Like Appetite for Health and T-Fal on Facebook. I Love to grill and this does look good! I love to grill and this doeas look good! I have liked both pages, signed up for the AFH newsletter and shared on my wall. I would love to win this so I can teach my family how to eat healthier. They would have fun grilling indoors and we wouldn’t have to wait for great grilling weather. Love the idea and thanks for giving me a chance to win! I do not have anything like that, only my pots and pans, I would love to have one and give it a try. I would feel good winning the T-Fal grill because I would cook food in a healthy way! I would love to win the T-Fal OptiGrill because my family is eating healthier and this is an excellent way to cook chicken, meat and veggies without adding unnecessary fat. It would be nice to grill food indoors when we have crummy weather outside. A long time follower of AFH and a new follower of TFal. I share articles on Facebook, IAE Hulthage.Working hard on lowering my blood pressure naturally, the grill would be a useful tool towards that end! I love that it has a frozen food setting, I always forget to thaw something out for dinner. Retweeted your Best Super Bowl recipes tweet (https://twitter.com/appetite4health/status/428705022961254400) @deedeethatsmee Go team! I would love this because I love to cook and I know some things are better grilled but I have a deep fear of handling fire…this would be a safe, healthy way for me to grill and make dinner even better for my family. I would love to have this. It has such great features. I love that it adjust to the thickness of foods. The fact that the plates and trip tray are dishwasher safe is also an added bonus. I would love to win this grill. It will help me eat healthier which is one of my New Year’s resolutions. i liked both pages, and would love to win this. I have a GF grill which has served me well, but it is a bit college-like. This would be an upgrade, and I would be able to clean up the GF and hand it down to a cousin entering college. 2 winners for the price of one! Ideal for cooking for one person, makes cooking a lot easier…Would love to win, have always wanted a GF grill. Liked both pages and retweeted link https://twitter.com/appetite4health/status/428705022961254400 Looks like and amazing indoor grill. Great features I have never seen on an indoor grill before. This grill is wonderful. Been looking for one.. Being adjustable is a plus. And it has a frozen setting. That would be very handy for my busy household. For a single Mom this looks like it would be so much easier to use than a regular grill. This would be perfect for me because I am by myself -quick,easy & healthy. I love grilling year round but sometimes it’s just me for dinner and I don’t want to fire up the grill for one person! This would be perfect. I subscribe to the newsletter and like the pages on Facebook. Love to win this grill…it would be a lot healthier eating grilled meat instead of pan frying. im on my journey to lose 75 pounds and need on the help i can get..
love grilled food but not right now in Illinois.